Beginning with the taping of the first Wilkins Coffee commercial in 1957, corporations over the years hired Jim Henson’s Muppet characters to sell milk, cleaning supplies, chow mein, and many other products. 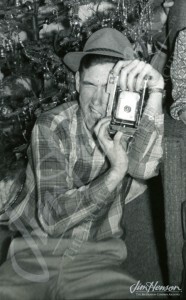 But when Jim Henson signed on to produce the first inserts for Sesame Street in September of 1969, his creations would be given even more important products to sell: The numbers 1, 2, and 3, and the letters A, B, and C. When the Children’s Television Workshop designed an educational show for pre-k children, they wanted Jim Henson to create characters that would reach out to young viewers, much the way his other characters reached out to consumers to sell products. At this point, Jim decided that he would not use any of his Sesame Street characters in corporate advertisements. He did not want to take advantage of his young audience by using their friends from educational television in a commercial setting. Click here to see information about Jim’s American Express Commercial from 1977. Jim taking a photo with his first Polaroid camera, Christmas 1956. 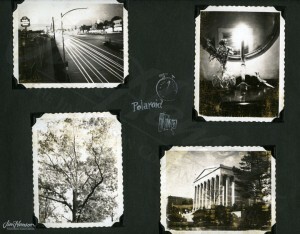 Page from Jim’s photo album with early Polaroid experiments, mid 1950s. 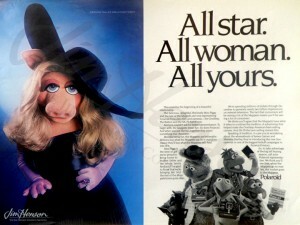 Miss Piggy stars in a Polaroid print ad, 1981. This entry was posted in 05-May '81, 1981, Commercials, Muppet Show, Sesame Street and tagged Camera, Children's Television Workshop, Fozzie, Kermit, Miss Piggy, Muppets, Polaroid, Wilkins. Bookmark the permalink.